Inuk Duo 6.8. 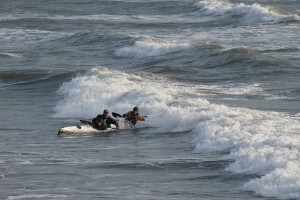 A fast expedition double sea kayak. From 2017 the "Inuk Duo 6.8." is available from Kirton Kayaks Ltd. The "Inuk Duo 6.8" double sea kayak, is suitable for both day paddling and long unsupported expeditions. The design emphasis is on stability and sea keeping, it is a true rough water double kayak. 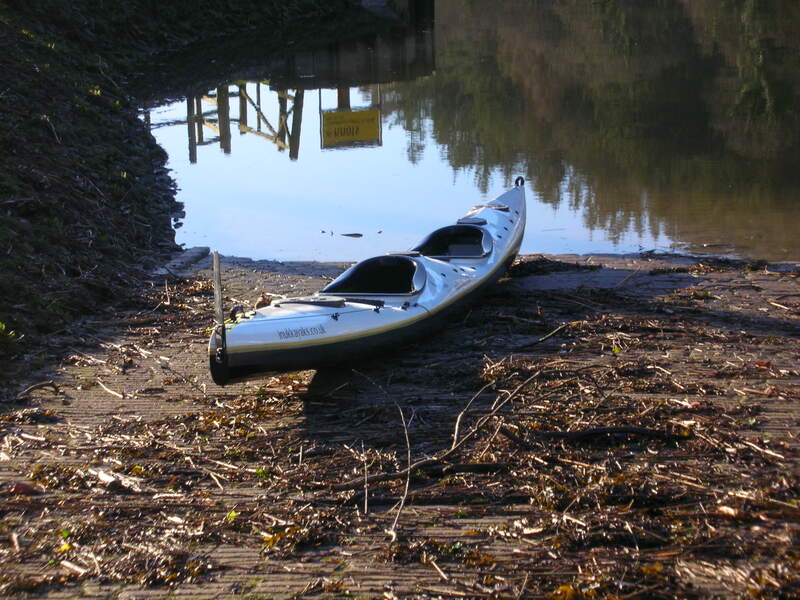 This kayak has evolved over many years with design influences from work carried out on doubles for Kirton Kayaks and Kayak Pro plus various “one offs”. The hull has a deep rocker curvature, deep V form bow with flat bottomed mid sections, with even rounded sections running aft to small transom. With all my double designs over the years I have tended to increase both the rocker and the bow volume, the Inuk Duo has followed this trend. The bow is very deep with a high V fore deck and pronounced keel rocker enabling the kayak to cope really well in the surf-zone (something doubles are usually poor at). 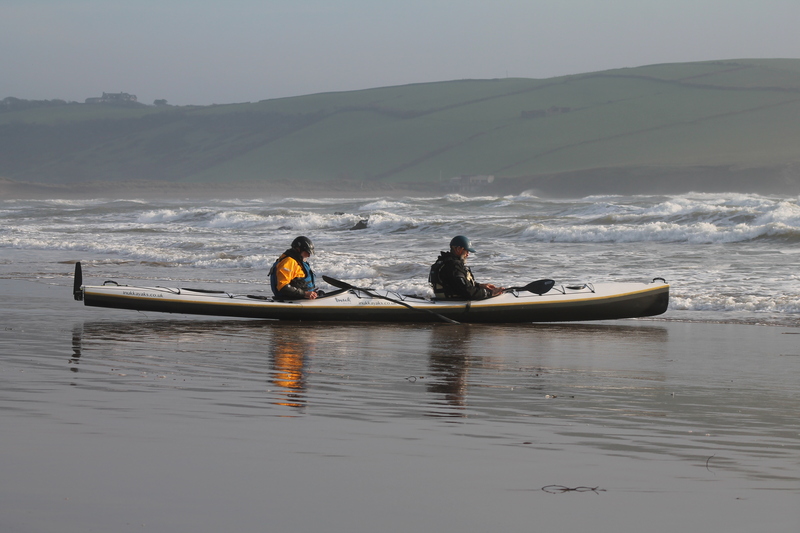 The keel rocker and flat mid sections means the Inuk Duo is exceptionally manoeuvrable, more so than many single sea kayaks. The length at over 22ft and the “Swede form” hull gives a sleek and easily driven craft for effortless long distance paddling. 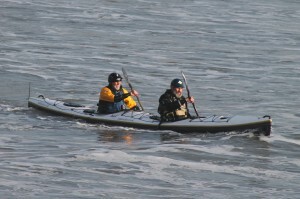 The cockpit spacing (between paddlers) enables paddling “out of sync” which is necessary for rough water maneuvering and control in / on waves. As this kayak is likely to be used for long distance trips, paddler comfort and seating position were a very high priority in this design. 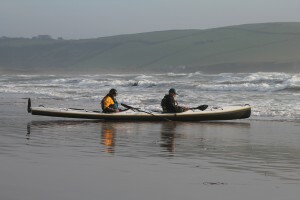 The high fore decks and key hole cockpits gives a comfortable and dynamic paddling position, either knees together (K-boat style) or out under the secure thigh braces for rougher conditions. The generous width seats are adjustable fwd- aft, padding and adjustable back-strap can be fitted. The "Inuk Duo 6.8" has a 6 hatch / 5 bulkhead layout, 4 large hatches & 2 small day hatches in fore decks. There is ample storage in four water tight compartments (will easily carry 60 – 100 kgs of gear) for expedition use. There are also 2 small day hatches in front of the cockpits. Additional in-cockpit custom storage options are also possible. 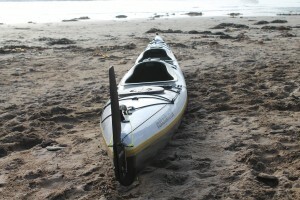 The kayak comes with the usual deck lines and bungees for storage of spare paddles and gear (custom layouts available). The kayak is fitted with “Smart Track” rudder as standard with an adjustable full plate foot-rest incorporating tiller controls in the forward cockpit. Adjustable foot-rest and / or custom position bulkhead in aft cockpit. There is also the option of either 1 or 2 “KayakSport” adjustable skegs. Various hand / foot pump options available. "Inuk Duo 6.8" double sea kayaks are custom built by Inuk Kayaks Ltd offering a range of constructions, colours and deck designs and fit out configurations to suit your requirements. See Inuk Duo 6.8 Specifications.